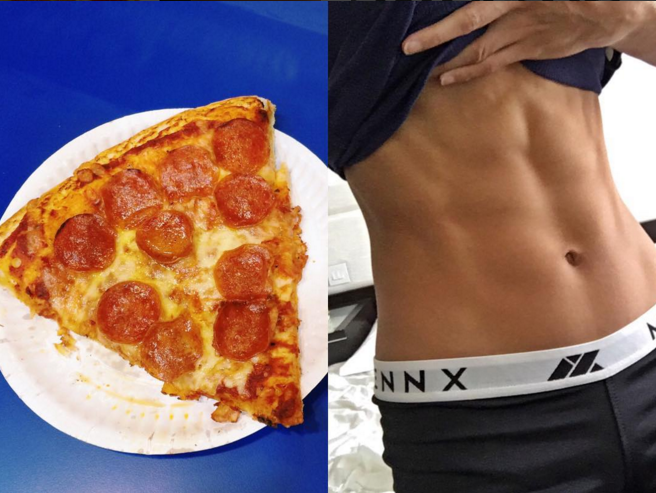 Home / All About IIFYM / So I Can Stuff My Face and Still See Abs with IIFYM? At face value, it may appear that flexible dieters just stuff their faces and still get ripped, but there’s more to flexible dieting/IIFYM than that. 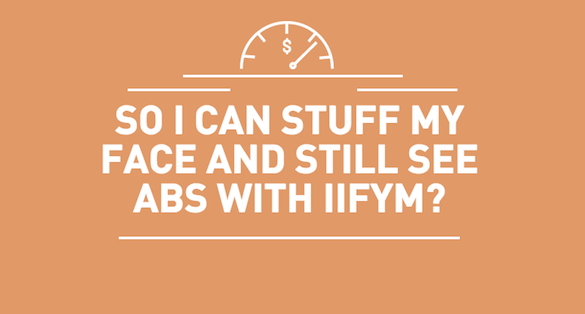 Can you get six pack abs with IIFYM? Sure, it’s possible! If you’re in a caloric deficit with a macronutrient intake of 150 grams of protein, 150 grams of carbs and 70 grams of fat, it would be impossible or impractical to fill your macros with pizza and fried chicken all day. To hit those numbers, you would need to consume a fair amount of lean proteins such as chicken breast, egg whites, turkey, lean red meats, fish, etc. alongside your carbs and fats. If you were to get all your 150g of protein from pizza, you would probably go over your carbs and fats as well. This is why the notion of face-stuffing and eating “junk” food all day with IIFYM is simply ridiculous. Proponents of flexible dieting also emphasize food sources and food quality. 100 grams of trans fat is crap compared to 100 grams of olive oil so it’s not as simple as tracking macros to the gram and calling it a day. If you care about the quality of your food, you will choose whole foods over processed foods. Also, flexible dieters are mindful of fiber intake—which is usually around 30-35 grams for males and 20-25 grams for females—hence the need for nutrient-dense and fiber-dense foods such as fruits and vegetables. Consuming all your calories from “junk” foods all day, every day, will probably make you feel pretty lousy. Definitely not what you’d want if you’re training hard in the gym. It’s not unusual to feel lethargic when consuming nutrient-deficient foods or “empty calories” so it’s important to find a balance of foods that would feel right for you and your goals. Simply following flexible dieting protocols isn’t enough to get a six pack. You also have to develop your abdominal muscles and cut enough body fat to reveal the muscle underneath. This can be done through training and a caloric deficit. Technically, if you stuff your face with leafy vegetables and remain in a caloric deficit, you can probably cut enough body fat to reveal your abs. However, if you stuff your face with calorie-dense foods, then you probably won’t cut enough body fat to reveal your six/eight pack.